On 22 November this year in Rome, the international Catholic pastoral charity and pontifical foundation ACN International will be publishing its latest report on “Religious Freedom in the World“. The presentation of the report will be accompanied by a series of publicity campaigns, prayer meetings and conferences around the world, scheduled to take place between 22 November and 4 December. 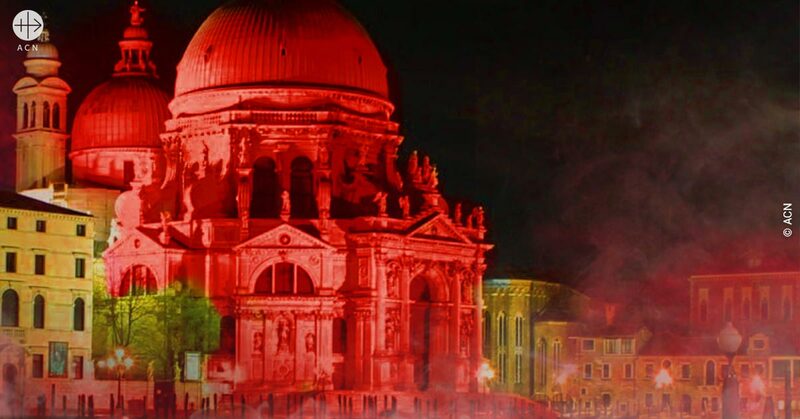 Once again this year a number of iconic public buildings will be illuminated in red in order to draw attention to the situation of people suffering religious persecution. „As an organisation committed to helping persecuted Christians, ACN has a particular duty to uphold the basic human right of religious freedom“, explained Dr. Thomas Heine-Geldern, the executive president of the foundation. „Sadly, there are more and more infringements of this basic human right, which affect all religions. We are therefore inviting people throughout the world to stand up together with ACN in defence of religious freedom and make a visible gesture of solidarity“, he continued. This is now the fourteenth ACN report on Religious Freedom in the World. It examines the situation in over 190 different countries and documents not only the current legal situation but also the abuses against the right to religious freedom over the time period 2016 – 2018. The report also details developments and changes in the situation in a number of the most critically threatened countries. On 22 November this report on Religious Freedom in the World will be formally presented to the world media in the Vatican. It will also be presented on the same day in other major international cities, including Madrid, Paris, London, Manila, Santiago de Chile and São Paulo. The launch in Rome will be carried out in the presence not only of the President of the Foundation, Cardinal Mauro Piacenza but will include among others invited guests from Egypt and Pakistan – both countries where Christians and other religious minorities suffered particularly severely from attacks on their religious freedom. In recent times the case of Asia Bibi has garnered particular international attention. This Catholic woman, initially condemned to death on allegations of blasphemy, was finally acquitted after more than seven years in prison – leading to violent protests by extreme radical Islamist groups in a number of Pakistani cities. Human rights defenders in a number of European countries are currently campaigning for this mother of 5 to be allowed to leave the country and be granted asylum elsewhere. ACN Italy is planning a spectacular campaign on 20 November, to draw attention to the plight of persecuted Christians. In Venice, the Rialto Bridge, sections of the Grand Canal and other important buildings will be illuminated in red. The idea of illuminating iconic buildings in red was initiated by ACN some years ago as a way of creating a striking and visible sign to protest against religious discrimination. Since then, the idea of a „Red Wednesday“ has become established in many places. Campaigns of this type will be held in the following cities among others (though not always on a Wednesday): Paris (22 November), Barcelona (23 November), London (28 November), Sydney (28 November) and Washington (28 November). In Barcelona the iconic „Sagrada Familia“ church will be illuminated in red, as will the „Sacré Coeur“ Basilica in Montmartre, Paris. A special dimension has the action in the Philippines: over 1300 churches and 30 schools will follow the call for Religious Freedom” and will be illuminated in red.